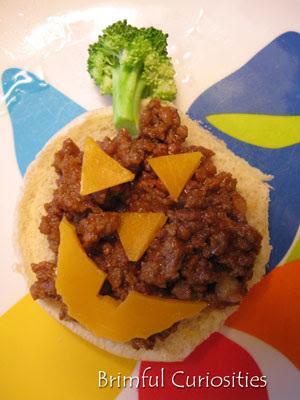 We made some fun and easy Sloppy Joe Jack-O-Lanterns for supper last night. A yummy treat for Halloween. Just cut cheese for the facial features and add to the sandwich. Broccoli makes a neat pumpkin stem. Plus, it's an excuse to play with your food! I think this is the first time that both my kids ate their entire Sloppy Joe. A little creativity goes a long way (but totally not my idea. I stole the recipe from a 2004 Taste of Home's Halloween Food & Fun magazine). Afterward we used our Mr. 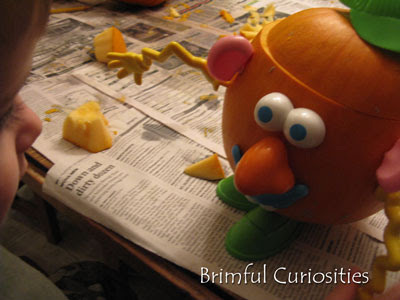 Potato Head pieces to create crazy pumpkins. What kind of pumpkins are you creating this weekend? Thanks for the sloppy joe idea... I'm filing that one away for next year. And I LOVE that you used Mr. 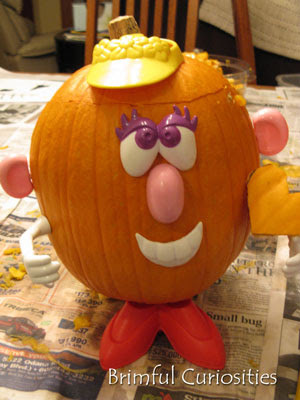 Potato Head pieces on a pumpkin... so clever!